The week is slowly drawing to a close, so we're bringing you our 'Digs of the Week' to kick off the weekend ahead! We're headed out of town for a quick trip to see family and help out with some house projects. Hopefully, it will be fun and productive! We will be back in town just in time for Earth Day and a get together with our neighbors. What, if anything, do you do to commemorate Earth Day? Happy Weekend! Here at Modern Digs, we're celebrating Earth Day with a sale on Greenington Furniture, which is made of eco-friendly bamboo. Yay! Who wouldn't want their backyard to feel like a resort? I want to recreate them all! Ellen Pompeo is selling (or recently sold) her Hollywood Hills Home and it is a Mid-Century modern haven. See for yourself here. The High Point Spring Market recently wrapped. Here are the biggest furniture and home decor trends to expect in the coming months. Before and Afters are so much fun, especially when the kitchen is decked out in the very same cabinets that you have in your own home. Seriously, this kitchen looks a lot like mine! And since I couldn't let a weekend go by without a DIY idea, I have included this planter that would make a wonderful addition to any outdoor space. 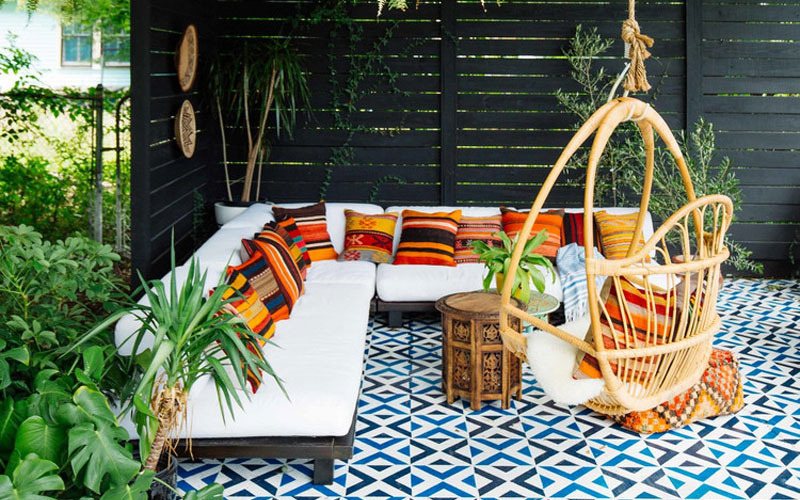 This colorful home perfectly complements the vibrant spirit of New Orleans, but my favorite space is that patio (shown above). Can you tell I'm really anxious to get my backyard done?